So much yarn, so little time. : I'm a winner! Aren't giveaways great? Winning is even better of course - so I was very pleased to hear I'd won Team Bacon's giveaway! What's that you say? You haven't heard of Team Bacon? 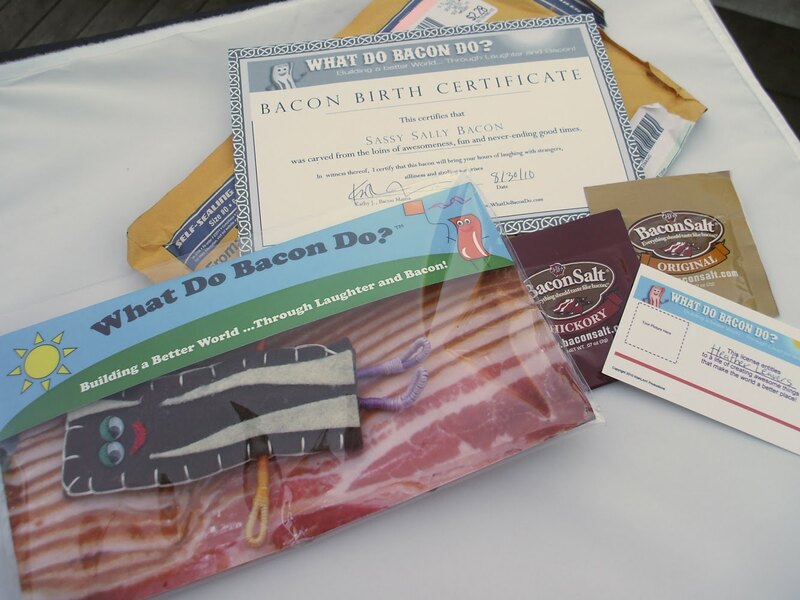 I'm not a member, but this is what their charter says: "Team Bacon stands for having fun with creative like-minded individuals and supporting charitable endeavors through our collective obsession with bacon. Bacon brings together so many people from diverse walks of life. Some prefer pork; some prefer turkey, some prefer soy; but all can agree that in all its forms, bacon is wonderful. Bacon connects the masses in a communal love for a tastier life." What's not to love? Mr Nifty knows the way to my heart inevitably involves bacon, so I consider myself a worthy winner! So - what did I win? 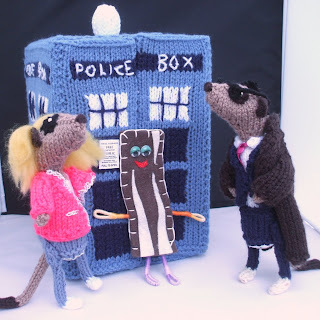 I'd just like to point out to those people who think I'm slightly eccentric for knitting meerkats in costumes that I am VERY sane indeed compared to BaconMama! Not only did my bacon come with a birth certificate, I also have a licence entitling me (compelling me!) to build a better world through laughter and bacon. I also got a couple of sachets of bacon salt - a product I had not known existed but for which I shall now scour the UK supermarkets! BaconMama asks "What do Bacon do?" then home again, where *somebody* discovered an opportunity for a photoshoot with the latest meerkats! Nifty! i didn't know it was you who won! I am a baconite! Is there a Sally bacon and meerkat wedding in the future? It would be SO fun! Love the Kent beach BTW, wish i were there! I love your meercats!... and their costumes!... you are very clever! 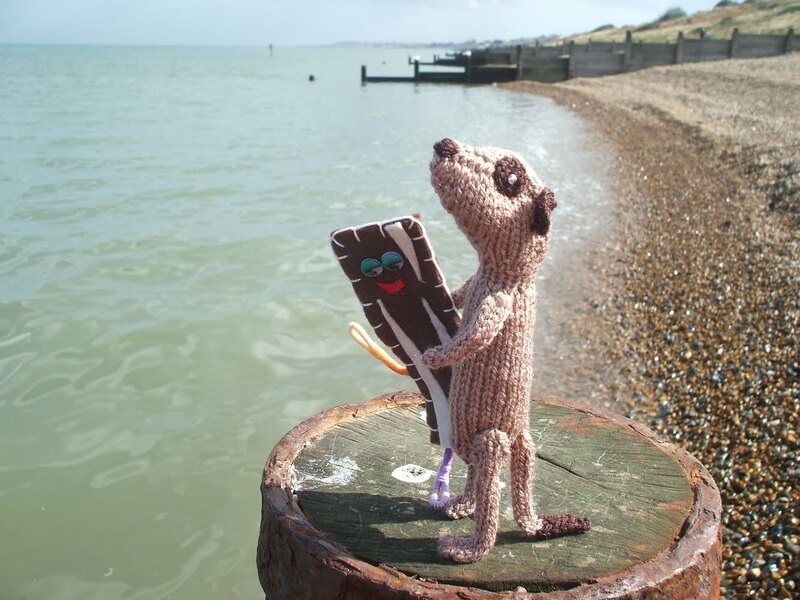 Ms Bacon seems to have found a perfect home with you and her many new meercat friends. Congrats on winning! *proud member of Team Bacon! Nifty, I just love to read anything you write -- so witty and funny! And, how your Meerkats have such personalities and expressions. 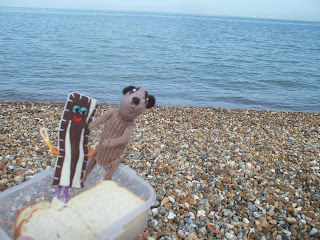 lol, Nifty, thanks for the smiles :) looks like your meerkats have a new delicious friend! i am so in love with your meerkats! i can not imagine a better bacon buddy! This is great, Heather, and it's wonderful to see you! SO happy to see Sally got such a great home! 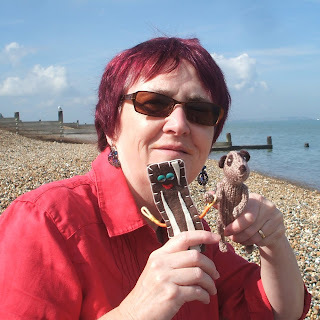 And she has some wonderful meercats to play with! YEA! Have fun with your new friend! SO happy to see Sally got such a wonderful home! And has such cute meercats to play with! Have fun with your new friend! Congrats! Couldnt think of a better winner for all that bacon love!